“If you look at today’s results I think that we easily have the strongest team here so that gives me a lot of confidence that I’m not going to be isolated on the climb." Tejay van Garderen (BMC) got his 2016 season off to the best possible start as he won his first time trial on European soil on stage 4 of the Vuelta a Andalucia. In a close battle with Wilco Kelderman (LottoNL-Jumbo), he beat the Dutch champion by two seconds while Jerome Coppel (IAM) was five seconds further back in third. Van Garderen also took the overall lead on the eve of the queen stage. We have gathered several reactions. Tejay van Garderen has stormed home to win today’s Individual Time Trial on stage 4 of Ruta del Sol and claim the race lead heading into tomorrow’s final stage. Van Garderen set a blistering time of 27’05 on the 21km course to take the win two seconds ahead of Wilco Kelderman (Team LottoNL-Jumbo) and seven seconds ahead of Jérome Coppel (IAM Cycling). Brent Bookwalter and Samuel Sanchez put in stellar performances to finish in fourth and seventh place respectively. Today’s win gives van Garderen confidence going into the rest of the season. “It’s great to get the first victory of the season early. Now we can take a more relaxed approach going forward. It’s a big confidence boost but we definitely have our minds set on tomorrow. 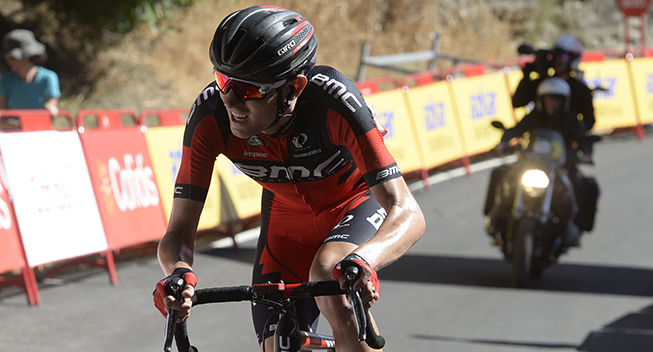 We’re going to have a tough challenge but we’re excited,” van Garderen said. “It was a tail wind on the way out but it was a lot of climbing and it was head wind on the way back but a bit downhill so it was really hard to pace. You couldn’t go easy on the way out and you couldn’t go easy on the way back, so you just had to put your head down and go. “The pacing strategy was definitely hard to calculate. So you had to really pace your effort well. We re-conned this course before the race started, we knew what we were up against and I think we got it perfect. BMC Racing Team Sports Director Valerio Piva said the team had targeted today’s ITT going into the race. “From the beginning we came here with the ITT in mind and the GC for Tejay. We came here after Murcia and Almeria and did a recon of today’s course to put Tejay in the best position to perform well. Today was amazing for not only him, but the whole team as we had three riders in the top ten. So we are very happy,” Piva said. Stage 5, 164.2km from San Roque to Alto Penas Blancas, tomorrow is set for a battle between the GC contenders with a showdown on the summit finish of Peñas Blancas. “If you look at today’s results I think that we easily have the strongest team here so that gives me a lot of confidence that I’m not going to be isolated on the climb,” van Garderen explained. “We’re going to get a lot of attacks from guys like Kelderman, Valverde and Poels so we just got to be ready. We’ll study the route well, try to get a good feel for it. We have Sammy Sanchez here, and he knows every road in Spain so we’ve got a good road captain. Van Garderen goes into the final stage with a two second lead over Kelderman and seven seconds in front of Coppel. Bookwalter sits in fourth and Sanchez in seventh, while Damiano Caruso maintains an eight-point lead in the King of the Mountain classification. LottoNL-Jumbo’s Wilco Kelderman finished second in the fourth stage of the Ruta del Sol, just two seconds short in the 21-kilometre time trial behind winner Tejay van Gardener (BMC Racing). Disappointment dominated Wilco Kelderman’s mood. Engels followed Kelderman in the team car during his time trial and saw that he did not miss a beat. Behind Kelderman, Maarten Tjallingii and Steven Kruijswijk finished 12th and 13th. They confirmed that the general level of Team LottoNL-Jumbo is high. Especially Kelderman, who has the chance to win the general classification of the Ruta del Sol on Sunday. Jérôme Coppel earned third place in the time trial for the Ruta del Sol. But that is also his place in the overall standings after four stages. Satisfied with his performance, the time trial champion of France is not ready to celebrate yet. “This was an individual time trial that was plagued with a lot of wind and a very steep climb,” explained Lionel Marie, directeur sportif for the team in Andalusia. “Jérôme is a specialist and he reconfirmed his talent here. He was disappointed because he wanted to win the stage. But we must remember that the top finishers on a day like today are all world class. IAM Cycling certainly hopes to protect Jérôme Coppel’s podium position. Wout Poels finished sixth in the day four time trial at the Ruta del Sol to set up a mouthwatering final stage in southern Spain. Poels finished 20 seconds down on new race leader Tejay Van Garderen and will have to attack hard on the race's queen stage to overhaul the American. Van Garderen (BMC) completed the 21km route in an impressive 27 minutes and five seconds to set the quickest time of the day. Vasil Kiryienka, who was one of the pre-stage favourites, finished 40 seconds down in 16th, while neo-pro Gianni Moscon produced a fine performance to finish 14th, just 36 seconds behind Van Garderen. Ben Swift, who started the day in the race leader's jersey, put in a brave effort on the hilly parcours and finished a minute down. Christian Knees, Nicolas Roche and Mikel Nieve all put in solid rides as the focus now switches to Sunday's finale. The five-day race ends with a punishing stage that includes five categorised climbs, the last of which takes the riders from sea level up to 1000m in just 14km for what should be a dramatic summit finish. Local favourite Alejandro Valverde (Movistar) is also a threat to Poels' GC ambitions, sitting seven seconds behind the Dutchman in eighth place overall. Sport Director Dario Cioni explained the course was a tough one, but he was pleased with Poels and Moscon, and he believes the Dutchman is confident heading into the final day. He said: "It was quite a demanding course. Our guys rode a good TT, especially Wout and Gianni. It probably wasn't the best course for Kiry, it was quite uphill with some high-speed, technical turns, that he doesn't love. "Wout is happy. He is 20 seconds down on Van Garderen who we know is not as good a climber. It will not be easy tomorrow but everything is open. "The plan tomorrow is to win the stage - that's all we can do." Alejandro Valverde and Javi Moreno stayed in the first sheet of the GC following a demanding TT - 21km in Alhaurín, with lots of climbing including the 15% Camino del Comendador, plus changing wind conditions -that saw them riding to 8th and 9th for both the stage and overall, 22” and 24” behind Tejay Van Garderen, new leader as BMC took three of the top seven places. The squad directed by Arrieta and Laguía will have a chance to prove their strong legs and get some places back on the Alto de Peñas Blancas (Cat-1), to be climbed twice after another three gruelling ascents in the 171km route from San Roque. It was a very impressive ride from Tobias Ludvigsson who completed the course in a time of 27’39” which was enough to a top-ten finish, a respectable 34″ seconds behind the winner. In the general classification, Tejay van Garderen moved into the raced lead following his stage victory. The first Team Giant-Alpecin rider in the GC is Tobias Ludvigsson in 10th place. Coach Arthur van Dongen said: “It was a tough time trial for our riders, with a steep climb and a lot of wind during the stage. “It was a strong performance from the team, especially Tobias who had the same time at the intermediate as eventual winner Tejay. Tobias is a lot more confident in the time trials now and he managed to finish in 10th place which shows that he can compete with the best. It was a windy, hilly 21 kilometers against the clock and the first big test for the overall contenders in Saturday's fourth stage at the Vuelta a Andalucia (Ruta del Sol). BMC's Tejay van Garderen stopped the clock at 27:05 to eke out a narrow win by two seconds over Wilco Kelderman ((LottoNL – Jumbo) and seven ahead of Jerome Coppel (IAM Cycling) and claimed the overall lead. Bauke Mollema (+38 seconds) and Fabio Felline (+41 seconds) gave strong performances against the clock to finish in 15th and 17th places respectively. "It was windy and a hard course. I am quite satisfied and where I finished was more or less my level,” Mollema said.” It was a good test; it has been a long time since I did a time trial 20kms or more, I think it was one and a half years ago, so that's long. It was an excellent measure for the rest of the season where there are a lot of races coming up with an important TT: Tour de France, Tirreno TTT, Basque Country... I am happy where I finished." Tomorrow the race concludes with a summit finish that will determine the final classification. Bauke Mollema sits in 14th GC and Fabio Felline in 16th ahead of the queen stage Sunday, and both riders will hope to move within the top rungs of the classification. Mollema showed solid time trialing form in stage four and rests 38 seconds behind van Garderen. With tomorrow's race finish tailored to his strengths, he will be gunning for a high result and top overall placing. Tim Wellens finished 19th but it could have been much better if he hadn’t almost gone down in a crash. ”Gutted to lose +20sec and nice result due to loss of control in a corner. Otherwise nice feeling. Should have been top 10 easy,” he tweeted after the stage. Majka and Roman Kreuziger moved up several spots in GC after today's time trial, both making it into the top 20. The squad now sets its sight on Sunday's grueling stage with the aim to win. After three stages ruled by sprinters, the fourth day of the Spanish race saw a demanding individual time-trial of 21 km, in Alhaurin de la Torre. With a slightly uphill finish, the race was dominated by time-trial specialists. Rafal Majka and Roman Kreuziger finished respectively 21st and 23rd, moving in the GC to 19th and 20th. "Majka and Kreuziger are still a bit behind in their-time trial preparation as at present we focused more on the preparation for the mountain stages," stated Sport Director Bruno Cenghialta. "We will now work even harder on time trials, but this shouldn't sound like an excuse. They both have a good physical condition, but it's not perfect yet for this kind of trial." Shortly after the end of the time trial Rafal Majka, one of Tinkoff's two co-leaders at the race, commented, "This was the first time-trial of the year and I think it wasn't that bad, but we didn't do too well either. We will nowl focus on tomorrow's stage where we will try to do our best although it will not be easy as we are at the beginning of the season and there are many riders who are already riding strong and fast. Our goals this season are still to be achieved, but nonetheless we are glad we have already won two stages, and then we'll see about tomorrow." The race will close tomorrow with the fifth stage that features five categorized climbs and a summit finish atop the Alto Peñas Blancas after a 16km climb with an 6% average incline. Without any previous, tough intermediate climbs that could create big gaps, a group of 8-10 riders could still come together at the finish. "As for tomorrow's stage, we still have to decide what our race tactics will be. We also need to see first how the other teams ended this time trial and how they're going to move tomorrow. However, we definitely aim at winning the stage", concluded Cenghialta. Team Dimension Data for Qhubeka did not necessarily have a specialist who could contend for the victory today but Kanstantsin Siutsou and Omar Fraile definitely gave the course a good crack, hoping to limit their time loss ahead of tomorrow's all important Mountaintop finish stage. Unfortunately, Siutsou, who was looking to be on a really good run, hit the deck during his time trial effort and would lose a good chunk of time but still managed to be the highest placed finisher. The Belorussian stopped the clock in a time of 28'38". Fraile was a bit further back, crossing the line with a time of 29'01". The rest of the African Team riders all got around the course safely. As Van Garderen posted a super quick time of 27'05", this leaves the African Team riders all over a minute off the race lead. Tomorrow's final stage is a mountainous 164km, that includes 5 categorised climbs. The final climb being a cat 1 climb to the summit finish in Penas Blancas. The African Team riders will look to take advantage of the time between themselves and the overall race lead to mount a real challenge for the stage victory. “There was not much for us to gain today but we did what we could. Tomorrow is the real Queen stage though and the organisers have changed the course which will make it even harder than it was originally. We are looking forward to the stage but Siutsou crashed today so we are unsure of how he will be performing tomorrow,” sports director Alex Sans Vega said.